I know you love me, even when you say you don’t. I know you love me, even when you don’t say it. How could you not love me?? I love you more than anyone in the world and have given you my whole heart. I know you love me because I see evidence of your love for me every day. I don’t need constant expression of how and why and how much you love me because I can see it clearly. We had only been a family for a few months, but had already been through a lot together. One night you were playing a game and asked me if you could play for another half hour before you went to bed. I told you, “Sure, no problem!” and you stopped playing and stared at me. I guess you had expected me to say no. Because you leaned over and patted me on the head and said, very sincerely, “You’re a good mom.” Those words (and that head pat) meant more to me than 1,000 I love you‘s. Every time you have vacuumed the couch or cleaned the bathroom or washed the dog or done the laundry I have felt your love. Every time a neighbor comes up to me and tells me how kind you were to carry their groceries or open the door for them I feel your love. When you serve you are speaking my love language; there is nothing that expresses love to me as powerfully as that. Or when you started brushing my hair. I have tried to create rituals around bedtime because you always had such a hard time sleeping. We would read or talk or I would rub your hands and feet or scratch your head. Then one day I handed you a brush and asked you to brush my hair while we had our nighttime talk. And you didn’t miss a beat. You got to work and took it very seriously. “Does it feel better when I brush all the way to the ends? Or when I use a lighter touch?” You wanted to get it right because you knew how relaxing it is to have a bedtime ritual. And because you love me. Lately, God has taken me on the craziest ride through love and heartbreak. I’ve mostly kept you out of it–I know it makes you scared to imagine someone else loving me that way. So when I’ve been elated I’ve tried to keep it cool around you. And when I’ve been hurt I’ve done my best to stay happy and faithful and not bring my pain into our home. But I know you saw it. And felt it. And when, after having been absolutely decimated by heartbreak, I decided to put myself back out there and open my heart to love again, I first asked your permission. I really didn’t want to do it if you couldn’t handle it because I knew it had been hard on you. But you looked me in the eye and said, “Mom, I just want you to be happy.” That was one of the most loving things I have ever been told. Someday, maybe I will find that type of happiness and we can share its benefits together. I have always heard you. A beloved minister and friend used to describe this thing that happens in parenting. He called it The Sweet Spot. There are these moments, usually unexpected, when your child just really needs you. When they are totally open to you helping them and loving them and teaching them. They often happen when you’re busy or in a rush or have somewhere else to be, but he warned parents to recognize these times and whenever they happened, to drop everything to be there and experience these rare moments with your child. My Sweet Spots with Rahul have often been when we are driving somewhere or walking together. He’ll just drop an amazing question on me or share something so vulnerable or big-hearted. Rahul is a very self-reliant kid, but sometimes we’ll have a Sweet Spot when he has experienced something upsetting and he needs comfort. When he got into a fight in school in 5th Grade he came home and talked about it with me, then just snuggled right into my arms and cried. Some kids do that all the time, but I can count on one hand the number of times he has done that in our 11 years together. All any parent wants to do when their child is hurting or when they’re celebrating is be there for them. To be present and be whatever their child needs in that moment. Two weeks ago we learned that Rahul’s dream college would be releasing their admissions decisions on Thursday evening at 7pm. Applying to this school was an act of faith on Rahul’s part and in the process of wishing he would be accepted there he learned to hope for it. He hadn’t hoped for something in a long time, and although he knew it was a reach, he proudly shared with anyone who asked him that this school was his first choice. I absolutely wanted to be there with Rahul when he received this news, because I knew no matter which way it went it would be a huge moment in his life. We had been through the whole college admissions process together and I was hoping too. I had been regularly going to the campus of this school to walk around it and pray about God making it clear where Rahul would thrive at college. And as that Thursday night loomed closer I knew I needed to be with Rahul when he logged into that portal to see the news. I knew it would be a Sweet Spot and I scheduled my whole work day around being home before 7pm. I have a mobile hairdressing business and that day my work took me all over the city. I was already running behind schedule by the middle of the day, when my appointment was with a client who wanted purple hair. The process of making one’s hair purple is a long, but fairly simple process. First you need to make the hair blonde by bleaching it. Then you apply the purple (or other rainbow unicorn color) to the blonde hair. This client had dark brown hair, so I had scheduled a couple of hours with her to allow time for her dark hair to lighten enough. But when I applied the bleach to her hair something really strange started happening. Part of her hair turned Jolly Green Giant Green. It turns out she had some old hair color in her hair and there are a whole bunch of reasons why it happened and there are one or two solutions I know of to remove this type of color from the hair, but the point is, this was totally unexpected and I had none of those MacGuyver quick fixes with me. So there I was staring at her Four Leaf Clover Green hair while time was ticking away and Rahul’s Sweet Spot was getting closer. I longed for a Renée clone. I didn’t want to leave my client sitting here with Spinach Green hair, but I couldn’t see a way to get home by 7pm. So I texted Rahul and asked him to wait for me to get home before logging on. I had actually set up the login passcode myself, and I laughed as I told him I wasn’t sharing it with him so I could guarantee that I’d be with him for this big moment! Eventually my client and I found a solution (we put blue on top of the Peacock Green, creating a dark teal color that is quite lovely) but by the time I left I was hours behind schedule. I still had one more client to see that night and although I tried to get her to reschedule, she really needed me. And even though everything in me wanted to ditch her and race home to my kid and his big news, I couldn’t abandon her. I couldn’t not do my job. And as time was ticking by I felt like I was in a nightmare where you’re running but not going anywhere. There was no parking in her neighborhood because there was a film shoot going on. (I parked in front of a fire hydrant and prayed my car wouldn’t get towed.) Then, the moment I stepped into her apartment she ran out of it because the heat wasn’t working and she had to go tell the super. So I stood there waiting for her while 7pm came and went. She finally sat down for me to apply her hair color when a neighbor called her asking her to let a city inspector into his apartment next door. (He didn’t have heat either…) When the city inspector arrived I was literally painting haircolor on her hair while she was talking to him. She left to attend to him while her hair color processed and I sat in her apartment as her smoke alarm went off because of the potatoes she was cooking. At this point I would have given anything to have a clone. To be two places at once. To not be a single parent, having to earn all the money to provide for my family, but also be the sole nurturer and caregiver. While the alarm rang over my head I sat down and put my hands over my ears and just stared up at God incredulously. I. Need. A. Clone. Right. Now. It was 8pm when I walked in the door. “Are you ready????!!! !” I asked Rahul excitedly. “Oh. I already logged on,” he said, as non-chalantly as possible. I couldn’t tell if he was serious or not. “I changed the login password and I already looked at it.” All the blood drained from my face as I realized he was serious. I had missed the moment. I hadn’t been here. He didn’t want to wait for me. I never hated the color green as much as I did in that moment. Cloning humans is not possible yet and therefore people like me–single parents, overworked business owners, busy New Yorkers–can’t be two places at once. So we miss things. We miss dance recitals or we have to turn down big clients or we are staring at Oscar The Grouch Green hair while our son learns he was not accepted to the college of his dreams. When he was so overcome with disappointment and had to experience it alone while you are parking your car in front of a fire hydrant and praying that the drug dealers on the corner will scare away the traffic cops for an hour so you don’t get a $125 ticket. When his heart broke while you were a few miles away stopping your ears and praying for a clone. I looked at the letter he received and was filled with sadness. Hope deferred makes the heart sick. The night before I had told Rahul that no matter what news we heard he needed to know that he is a very special student. His mind is incredible and his resilience is unbelievable. And if a school doesn’t value those things over all else, it’s not the right school for him. So after 20 minutes of feeling sad, I was totally fine. I knew that God had a better situation for him, where he would truly thrive, and I haven’t felt badly about it since. And a few hours later, we had our Sweet Spot. Rahul knocked on my door and wanted to talk. We sat together while he told me how disappointed he was, but how proud he was of himself for hoping for something. I jumped on his bed when I realized that this decision meant he would be living at home with me for a few more years (the dream college is the only one he applied to where he would need to live on campus). We talked for hours and prayed and I accepted that maybe all the events of the day had played out exactly as they needed to. I couldn’t be in two places at once, but in the end I was right where he needed me to be. When my son was 7 1/2 years old he was unable to imagine anything. He didn’t understand what people meant when they asked him what he wanted to be when he grew up. He didn’t play games with imaginary friends or made-up worlds. His world was extremely literal. He had known more loss that any human should have to know and had already lived 1,000 years of sorrow by the time I met him. I remember the first time I heard him imagine something. We were driving in my Jeep, listening to music and he requested that I repeat a Sarah McLachlan Christmas song over and over. The music, he said, made him imagine. He had conjured up a scenario where he was riding a dragon through space, free and powerful. I loved hearing his fantasy and played the song over and over to let his little mind open up. Dragons became a common theme in his imaginary worlds. After his bff Justin and he saw How to Train Your Dragon, I remember Justin and Rahul conjuring up an imaginary playmate in Toothless, the dragon in the movie. I remember feeling so grateful for Justin one afternoon when the two of them were battling the monsters of Riverdale with Toothless at their side, something I don’t think Rahul could ever have conjured up on his own. One evening, Rahul created a “luxury experience” for me in his loft bed. He mounted a small video screen on his ceiling with duct tape, brought all his stuffed animals up to his bed and invited me to squeeze up there to watch whatever movie I wanted and while he fed me and snuggled with me. I chose Monsoon Wedding and we watched a few minutes of it before he grew bored and switched gears. He turned it off and then he turned off most of the lights. As we lay in the dark, he told me we were going to imagine together. He created a scenario where we each had dragons and we got to assign them super powers and we listened to music as we imagined them fly us into outer space. Tears rolled down the sides of my face as I lay there with him imagining our dragons and understanding that he was healing. He was expanding and evolving. The freedom he loved to imagine with his dragon was the freedom he was beginning to feel in his life. My little boy is 18 now. He knows exactly what he wants to be when he grows up and is well on his way to achieving it. This weekend the third and final installment of the How to Train Your Dragon movies came out and we were there in the same theater where we had seen the first and second ones on the first night it came out. Even though he is practically a grown man, he still loves his dragons. His favorite video games are ones where he can ride imaginary creatures and fly. And he has learned to fly for real! He is on his way to getting his pilot’s license and regularly gets to fly a real dragon (in the form of a Cessna) through the sky. When we were on our way to the movie the other night I reminded him how dragons had taught him to imagine. And I remembered another special time we shared when he was younger. We travelled to South Dakota to dig for dinosaur bones, and after we found them we camped in the Badlands. One night the winds were blowing our tent sideways and rain was starting to fall and we had to abandon our usual post outside the entrance to our tent playing monopoly and hunker down inside the tent for the night. I was struggling to come up with something for us to do in there together when Rahul’s eyes lit up and he pulled out his Kindle. He had downloaded How to Train Your Dragon and we snuggled up in our sleeping bags for the rest of the night watching one of his favorite movies. Everything about that night felt so perfect to me. The winds were howling all around us, and all we had was a flimsy tent to protect us from the elements. But we were so content together, hundreds of miles from home, huddled around a small screen, imagining dragons. Well, here we are. It’s Rahul’s first day of his senior year. The last first day of school. Rahul didn’t start school formally until 3rd grade. He had some lessons in his orphanage in India, but couldn’t read or write Hindi (his native language) or English. And when he arrived home with me in April 2008 it was practically the end of the year. I put him in a 2nd grade class, and he had a few weeks of school where he got to participate in field trips and perform in concerts. One concert, his school’s annual dance concert, was life-changing for me. I didn’t know what to expect–actually, I didn’t know what to expect about any of his school experience–and I had a conference call with my work team that morning. I thought surely I would be finished with the call by the time the concert started, but the call just kept going longer and longer. I tried to keep up, but I had my video camera in one hand, my regular camera in the other and my phone to my ear. (If only I had an iPhone back then!) And as Rahul’s group got up to perform, tears were streaming down my face as I watched him keep up with the class that had been learning this dance for weeks. I hung up on the phone call and quit my job soon after. I had realized that I couldn’t do it all and would have to find a more flexible job if single parenting this child was going to work. He repeated 3rd grade with the same teacher both times to give him a chance to catch up. Then we switched him to a Special Education classroom in 4th grade when he still hadn’t learned to read. The summer before that school year he had a neuro-psych evaluation done and I wanted his classroom teacher to have this valuable document with all his test results and recommendations on it before school started. But despite my constant calls to the school, I could not get through to his teacher. So on the first day of school I marched him into his classroom to hand it her. Except when we got to the room there was no one there, the lights were off and the chairs were on top of the desks. We walked all over the school looking for his teacher and finally found her in the cafeteria. Apparently that’s were the Special Ed students gather in the morning. No one had informed us. I confirmed with his teacher where to pick him up at the end of the day and left my once excited, now crestfallen child in the cafeteria. At the end of the day I waited outside the door he was supposed to be exiting from and watched as every 4th grade student in the school ran out into the arms of their waiting parent except my son’s class. I was really angry and panicked by this point, because Rahul has an attachment disorder and if I don’t show up on time it triggers a PTSD episode. He thinks I’ve left him and am never coming back. Even now. So that day I marched into the school to find him and there he was, with his confused teacher, wandering the halls. I was supposed to pick him up from a different door. I had already made multiple calls to the school that day to complain and when I got home I made one more. I found an ally in Mr. Manny, the vice principal and he assured me we could work together to improve things. I was still very upset and uneasy, so I decided I needed to go to his school and call on a different ally. I left Rahul home, walked the 2 blocks back to his school and walked around and around the school, praying. I prayed for every single human in that building. I prayed that the adults in the school would love Rahul and be charmed by him. That they would always have their eye on him. That he would find favor with all his teachers. That he would grow and learn and be safe and feel secure. I prayed until I was done, and in the end had probably walked around the school 10 times. And this walking and praying has become an annual ritual for me. Each year, on the first day of school, I take time off of my job and I walk around and around his school, praying. I pray until I’m done. And as I walk around I picture the instructors at Hogwarts casting spells of protection around the school as the dementors are closing in. I realize I’m not casting spells, but I love to picture creating that same type of bubble around his school. I imagine my prayers traveling through the school like incense wafting through the halls and under the doors and up the stairs, until the whole school is covered by God’s protection and love. I walk away secure and confident that my child is not alone in there. That he has a spiritual army walking with him wherever he goes, whispering in the ears of his teachers, moving in their hearts. Someday I will write about all the amazing things that have happened to Rahul throughout his school career. It’s nothing short of a series of miracles. But for now, I want to absorb this last first day of school. This last prayer walk around the campus. I want to make it count, for him and for me. And as I move through this school year, throwing out each month on the calendar as we creep closer and closer to the end, I want to remember that armies surround me too. That I am not alone in my sentimental recognition of Rahul’s lasts and firsts. And that there are still many “firsts” yet to come. “Where’s Robyn?” my mom asked, sounding a little frantic. I looked around for my sister. A while earlier, she had asked me to watch her as she did some yard work. Robyn and I were playing in the sandbox. Except now it was just me playing in the sandbox, lost deep in thought in some imaginary world, as usual. I looked up at my mom with a mixture of fear and guilt. Because I had lost track of her. I was 4 years old. As my Mom’s eyes filled with fear and confusion we both heard a loud squeal. Her eyes widened in terror and she went tearing around to the front of the house, screaming. I looked down at the sand creation I was building and quietly set down my tools. I felt a pain in my stomach like a stone as I realized what a horrible sister I was. Slowly, I crept around to the front of the house, going around the opposite side than my mom had travelled. As I rounded the corner I could see Mom carrying my 2 year old sister in her arms. There was a huge truck stopped in front of our house and I came to realize that Robyn had been crawling across the street, completely unattended by her big sister, when this tractor trailer rounded the curve at the bottom of the hill in front of our house. It was going full speed when the driver hit the brakes because of the baby crawling across the street. My mom had arrived just as he was picking Robyn up and carrying her toward our house. I stood, unnoticed, off to the side of the house, in the middle of the driveway. I watched as my mom gratefully carried Robyn into the house to tend to her and nurse her own guilt and fear. And I remember just standing in that spot staring at the ground for a long time. I didn’t cry. Or run to my mother. I just stood there. Realizing I had nearly caused my sister’s death. Rooted to the ground with guilt and shame and embarrassment, unable to move. I was hoping no one noticed me there, and I understood that I didn’t deserve comforting. My pain was self-inflicted and my mom and my sister were the ones who really needed tending to at that moment. But also, I felt forgotten. I think everyone has a baseline fear that drives and informs their life. Most likely it is shaped by some childhood experience or trauma. It might be the fear of being alone, or the fear of being rejected. My son’s baseline fear is not being believed. He experienced a terrible trauma as a child when he lived in an orphanage in India, and when he told the orphanage director about it, she didn’t believe him. Of all the traumas he has suffered, that is the one that affects everything he does: not being believed. He is honest to a fault and will turn on you with violence if you accuse him of lying. My baseline fear is being forgotten. I only recently realized how much this fear paralyzes me. One of the things I have loved most about being Rahul’s mom is our closeness. We share everything and have been through so much together. We have a really deep bond that has been created through trials and fighting and a lot of hard work and love. Our attachment to one another is well earned. And because of his special emotional needs, we have spent more time together than most families. Last winter, as Rahul and I were talking about what it will be like for him when he goes to college next year, I suddenly realized what it will be like for me when he goes to college next year. I realized that although he will most likely live at home for the first few years of college, everything is going to change. For the past 10 years I have completely built my life around him. I created my business based on his school schedule and special needs. I sacrificed nearly all of my social life to spend most of the time when I’m not working caring for his needs. I sleep half the amount I used to before I adopted him because he has trouble sleeping and because of the demands of my work. I have no money because his special needs drained all of my savings and investments when he was younger, and I’ve spent the last 8 years digging myself out of that financial hole. Well, all of that is about to change for me. Which seems like it should be a good thing! I will be able to choose a different work scenario, where I can earn more money and receive benefits. I will sleep more! I will be able to socialize like I used to. But all I can think of is this sinking feeling of being forgotten. I picture this vague, depressing scenario where I’m home alone with my cat and everyone has forgotten about me and moved on with their exciting lives. (My beloved dog Baby Fish Mouth is very old and I anticipate that he won’t be around much longer than Rahul’s high school career.) And that no matter how much I push myself into my friends’ lives and continue to care for my my son’s needs, I won’t be woven into the fabric of anyone’s day anymore. I won’t be the first person anyone sees every morning and the last person anyone sees every night. I don’t fear being alone, I’ve always been comfortable being by myself. But I’m terrified that I will be alone because I’ve been forgotten. I try to explain this fear to my friends and I realize it doesn’t make any sense. I have friends that are closer than family and will never leave me. My friend Libby started crying when I told her about this fear, because she would never forget me and has proven over and over how much she is willing to do to be there for me when I am in need. I recently went though something really heartbreaking and my friends came swooping in from all over the place to take care of me. Calling me from far away night after night to talk and pray for hours. Traveling long distances and leaving their families behind to come take me out to dinner or go on a picnic to get me out of the house and keep me talking. It was extraordinary and I felt very loved and taken care of. But with all of this proof of love and devotion, I’m still terrified. It’s irrational, but the feeling I fear is the same one I felt when my sister was almost killed. I fear that other peoples’ needs are going to always be more important than mine. I fear that because I am so fiercely independent people will assume I can always take care of myself. I fear that because I’m not usually the one in the middle of dramatic situations, because I’m not particularly needy or a squeaky wheel, people will assume I don’t need their attention. I fear that because the things I need are simple and quiet: a hug every once in a while, a text or an invitation to let me know I’m on your mind, a visit for no other reason than to spend time together–that people will forget that these things make me feel loved and seen and valuable. I’ve been avoiding all the things I should be doing to prepare Rahul for his college career. I can’t seem to get motivated to research scholarships or set up school appointments or make travel plans to visit schools. And the time has come. We have a lot to do this summer and I can’t delay any longer. Time marches on and I don’t want him to miss out. So I am resolving to face my fear and to push through it. I am traveling back in time to visit that little girl standing in her driveway, scared and ashamed, and giving her a big hug. I’m looking her in the eyes and telling her it’s OK and that I see her pain. I’m reminding her that her family loves and cherishes her and that no one blames her for what happened. I’m walking her into the house to find her mother and ask for the comfort and reassurance that she needs and will surely be freely given. And I’m convincing her that she is not forgotten. I see you standing on the verge of entering that amazing world of romance and dating and heartbreak and true love. And I want to offer you some advice. Some insights to arm you against disappointment and some guidance to get you on your way. I sometimes think I am really under qualified to teach you about this, since I never married. But you often remind me that I can tell you what its like on the other side of the relationship–the woman’s side. And conveniently, you like girls. And I’m a girl. So there’s that. And believe it or not, I’ve actually had lots of experiences with love that should help you out. So here are my words of wisdom. Don’t kiss a lot of frogs, but do date a lot of princesses. Some people think that you have to endure lots of sucky dates with disappointing potential love interests in order to find that true “princess” who is a million times better than anyone else. I don’t agree. I think when you approach dating as a way to build friendships and encourage each girl you spend time with, you will more easily see your way to finding a true companion. You are spiritual and God-centered. Date girls who are likewise. You will connect with them on a deep spiritual level, and even it you are not attracted to one another, you will have made each other’s lives richer for having spent time together. Notice how they make you feel about yourself. You will probably be interested in many women over the next few years. You will think they’re sweet and cute and beautiful and they will occupy your thoughts and you’ll feel like you’re going crazy. That is how it is to fall in love. But before you’re in too deep, take note of how you feel about yourself when you’re with her. Not how you feel–how you feel about yourself. If she doesn’t make you feel like you can be a better man, that you are capable of so much more because she believes in you, that you are the most wonderful, strong, gorgeous man when she is looking at you, she is not for you. Period. It’s the easiest litmus test, and if you can’t see it clearly, I guarantee the people around you will see it. Ask them. Women have the power to build up or tear down a man with their words, and if she is playing games or manipulating you it will be obvious by how you feel about yourself. Notice if they seem to want to change you. If she doesn’t love you for who you are right now, she doesn’t really love you. Some people really love a project, and they fall in love with the idea of you instead of the actual you. And you’ll be able to tell, because she will always be a little bit dissatisfied with your clothes, or your choices, or your timing, or the flavor of gum you chew (true story…). And even if you try to change these things she will find something else to pick at. Don’t forget the “friend” in girlfriend. I know I tell you this all the time, but its true. If you want a girlfriend (which you often say you do) the best way you can prepare for that is to be a really great friend. Nurture all your relationships, and really try to be the best friend you can be to all your buddies, classmates and long-time pals. Because all the romantic gestures in the world won’t mean anything if you don’t know how to be really great friends with your girlfriend. Speaking of romantic gestures, make them sincere. Now, this could be just me, but I think most women prefer small, spontaneous, romantic moments more than grand fanfares. When I look back over my life and think of the most romantic, meaningful moments, the ones that stand out are so sweet and small they are almost hard to describe. For instance, once I was talking to this man that I loved and the wind blew my hair in my face and it stuck to my lipgloss. And he just reached up and gently pulled my hair free, all the while giving me this look…The world stopped. These are the moments we love. Give gifts that show her that you know her. A woman who loves you will be so encouraged by any gift you give her, but you really want to show her that you understand her. This is very important to women–we want to know that you see us. For some reason, there was a period in my life when every guy that was interested in me gave me a teddy bear. I remember one day, opening up my closet and looking at this whole shelf of teddy bears and thinking, “Who is out there telling men that I like teddy bears?” You know me. Do I seem like I would like teddy bears? No. And it’s not that I didn’t appreciate the fact that these amazing men were going to the trouble of buying me a sweet gift, it’s that the gift just made me realize how much they didn’t know me. And that can be discouraging. It’s not hard to find out what a woman likes. Just ask her! Chase her… When you find a woman who you are really crazy about, let her know. And we like action, not just words. Send her a letter, get to know her friends, surprise her at her job or her class, write her a card, send her encouraging texts just to tell her she’s special and you’re thinking about her. There was this boy I loved many years ago, who would run down the street after me in the winter, having forgotten his coat, just to walk me to the train. Still, when I wonder if someone loves me, I think, “But would he chase me down the street just to walk with me for a few more minutes?” If the answer is no, I realize it’s not love. …but don’t stalk her. Not everyone you fall in love with will love you back, I’m very sorry to say. And if you are getting a firm “no” from her, that she is not interested in you, you need to let it go. Of course there’s always the chance that she might come around, but that will be more likely to happen if you can move on and give her some space. It is a really horrible feeling to be the object of someone’s obsession. It is not flattering. It’s guilt-inducing at best, and terrifying at its worst. For instance, when you’ve already told a co-worker repeatedly that you are not interested in him and he proceeds to fill your locker with flowers and buy you candy and gives you a painting–of yourself–that he painted…this is cause for great alarm and fear, not for a change of heart. And every moment you spend on a woman who does not and will not love you, is a moment you are taking away from the one who will. Don’t be afraid of a mess. Because love is really, really messy. You will be floating on air one moment, and curled up in a ball on the floor the next, only to be followed by more elation, then another crushing blow. I think falling in love feels like floating on a small raft in the ocean. It’s a thrilling ride, as the waves pull you out to sea, and you sometimes feel like you are about to be sucked under the water, then just at the right moment, you find complete tranquility and calm and bliss. There are so many highs and lows–life and emotion are heightened unlike anything else. You will feel completely powerless over it and terrified of it. And you will also feel like you can’t live without it. You will be walking down the street by yourself and suddenly burst out laughing when you think of something funny she said. And certain songs will make you weep with the exquisite pain of your heart opening up to her. You will be confused and seriously wonder if you are going crazy. Your knees will buckle when you think about holding her in your arms. You will think of her when you’re brushing your teeth and when you’re taking a test and when you’re riding in the car and you will eventually say (accidentally) out loud, “Get out of my head, woman!” You will feel like she is tying you up in knots and also that she can help you become anything you want to be. You will feel strong and confident and happy. I can’t wait. You deserve to live life to the full and to be loved completely. You will be amazing. And I will be proud. 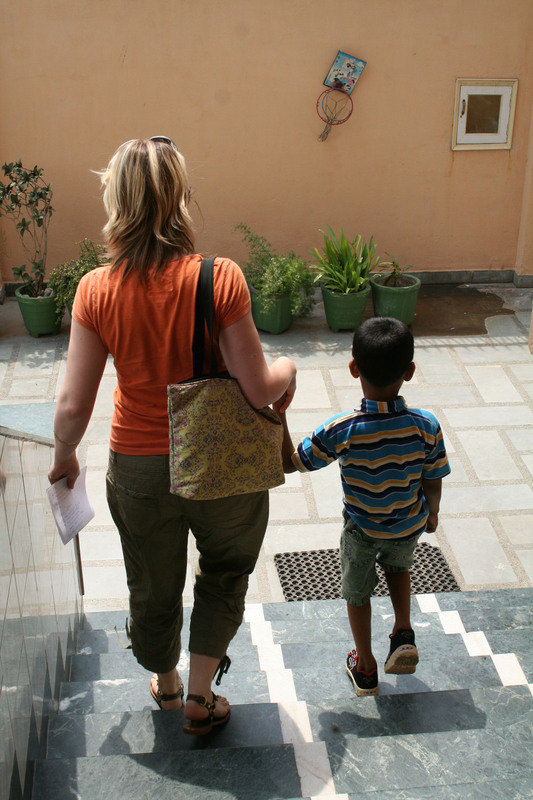 When I adopted my son Rahul, 10 years ago, he was 7 1/2 and living in an orphanage in India. Imagine how strange it was for him to suddenly be in a family! I had to help him to trust me and bond with me and I worked hard to create ways for him to attach to me. One of the first things I noticed was that when I would try to pick him up to carry him, he didn’t know how to be held. His arms and legs just hung limp. He didn’t ever learn how to mold his body around an adult because he hadn’t been carried around when he was young. I couldn’t overwhelm him with bear hugs and snuggling–for a child who had rarely been touched, that would be too much. So I created games to help him get used to physical closeness. He loved to play Hide and Seek and our ritual was that he would always find his way to “home base”, then I would run over to him, swing him around and tickle him. It was always so great to hear him laugh the way a kid should be laughing. We would play that game for hours and hours. We would have pillow fights and I would swing him back and forth like he was a bell and when he wanted to look at something on the computer I would sit him on my lap, so we could look together. I also created attachment through food. In an orphanage you don’t get to choose when or what you eat, so Rahul didn’t understand the feeling of hunger. I would put food all over the house so he never would need to panic that he couldn’t eat. And when it came time for meals, I would always prepare his food, and even if we were at someone else’s house, I would serve it to him, so he would learn that he could rely on me to take care of his needs. One of my favorite moments from our first few days together was when we were at the airport in India, killing time while we waited for our flight to NYC. My Dad and my best friend were with us and when we adults saw a candy counter we walked over to buy some snacks. I turned to Rahul and asked him what he wanted. He looked at me like he had never been asked what he wanted before. Then he pointed to a pack of gum. Then he asked if he could have two! It was the best feeling to be able to give this child something he wanted and to see the look on his face when he got it! It is one of the joys of parenting to give your children gifts. In our early days, I would take him shopping a lot because I hadn’t bought him many clothes or toys before he came. And as we ran around the store he would point to things and I would just throw them in the cart! I wanted to let him know that I thought he was special and that he was worthy of receiving gifts and getting what he wanted. And that being in a family is good, happy thing. When we would walk anywhere together I noticed that he hadn’t learned to walk with other people as a group. He had no sense that we were a unit and that to stay safe, he would need to walk in step with me and keep an eye on where I was leading him. So my Dad made up a game for him where he would point to a car parked further down the road and have Rahul run to that car and wait for us. He would get so excited to run ahead and he would always wait, so that led to lots of other games where he and I would run up different sets of stairs and wait at the top for each other, or he would run through the circular driveways (on the sidewalk) all over our neighborhood and wait for me at the end. Mostly, I would just talk with him as we walked, so he had to keep his eye on me and stay within earshot. Bedtime was hard. You can imagine how lonely and scary bedtime might be in an orphanage, and this is often a really tricky time of day for kids who have spent time in one. So we created lots of rituals around bedtime that made it fun and safe. My favorite one was our reading ritual. I would make him a snack and go sit on the couch and start reading while he was still bouncing around the house. After a chapter or two I would have him come sit on the couch with me. And he still had so much excess energy that he would sit and kick his arms and legs and roll all over the place for a few more chapters. Then I would sit closer to him and put my hand on his head or his foot or his shoulder, and I would slow my reading down while he started to settle down. And eventually he would fall asleep and I would carry him up to his loft bed. There were many nights that I would be reading for 4 hours or more! These experiences taught me so much about how God loves me. We are all God’s adopted children!1 We don’t always know how to take in what He is trying to do for us. He is my parent, and whether I know it or not, He’ll always be trying to love me more than I could ever love Him. Like I had to be careful to not overwhelm Rahul, God is careful not to overwhelm or overload us. He has given me friends to help me carry my load and He uses our relationships with each other to express His love for us. Like I had to teach Rahul how to rely on me to provide for him, God quenches my thirst and nourishes me with His word. Like I love to give Rahul gifts, I’m learning that God loves to give me good gifts. And He gives them just because he loves me and wants me to be happy being a part of His family! Like I taught Rahul to walk with me, God has provided a way, through Jesus, to talk to Him directly, so He and I can walk together wherever I go. Being Rahul’s mom has taught me that is who my Father is.